Which dessert can take shape as a chip in your favorite cookie or as a bar, and can be enjoyed in both a liquid and solid form? That’s right- it’s chocolate! Most of the time that you take a bite of chocolate, however, you probably don’t think about how a peanut-sized cocoa bean was crafted into the smooth, shiny, and sweet dessert of your dreams. The complex transformation process includes a variety of chemical reactions among the approximately 380 chemicals that comprise it (Kuwana, 2010). In this article, you are going to learn about one such process that highlights chocolate’s unique chemical properties and how you can replicate this fundamental technique on your own. The word temper meaning to heat to make hard applies to chocolate by making it solid at room temperature and perfectly melted you begin to chew it. As a chocolate lover, you should be very appreciative of tempering because the cocoa butter can solidify into 6 different kinds of fat crystals, however only two of these structures produce a stable/hard chocolate that is palatable (McGee, 2004). To ensure that the ideal texture is achieved, tempering is needed. Tempering generally follows a three-step process of heating the chocolate to dissolve the fat crystals, lowering the temperature slightly to form a new crystal structure, and reheating to dissolve all unstable crystals. 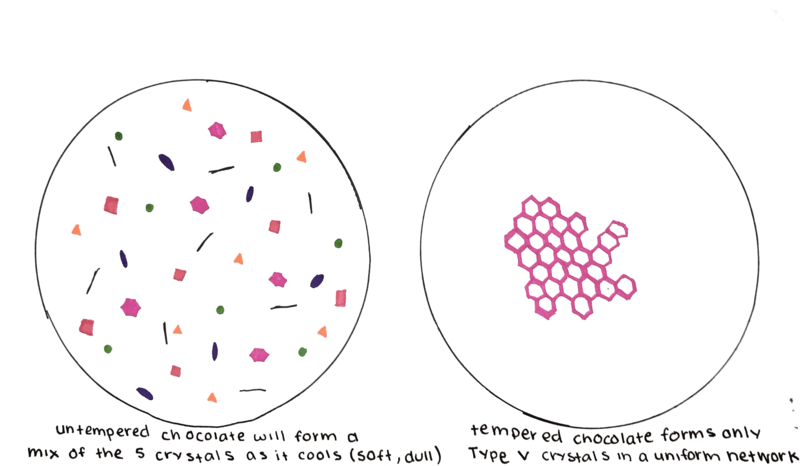 This way you are left with only the desirable and stable crystals, which can then control the development of the crystal network upon the solidification of the chocolate (McGee, 2004). The stable cocoa butter crystals have a higher melting point meaning they form at a higher temperature than that of unstable ones. 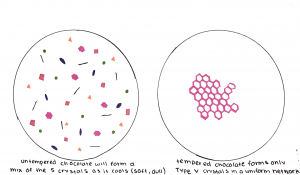 This follows the same principles of the method of slow-cooling crystallization where a rapid drop in temperature doesn’t provide the stable crystals with enough time to assemble before the unstable ones are already forming. Basically, the key to tempering is keeping the chocolate temperature below the melting point of stable cocoa butter crystals, but above that of unstable ones (this varies depending on the type of chocolate and the ratio of cocoa and milk fats). To temper the chocolate from scratch, heat it to 40-45°C to melt all crystals, and cool it down to around 27-28°C. Then either stir the chocolate as it cools further, until it thickens noticeably (an indication of crystal formation), or pour a portion onto a cool surface and scrape and mix it until it thickens, and return it to the bowl. Then carefully raise the temperature of the chocolate to the tempering range, 30-31°C, and stir to melt any unstable crystals that might have formed during the stirring or scraping. Kuwana, Ellen. “Discovering the Sweet Mysteries of Chocolate.” Neuroscience For Kids, Eric Chudler, 01 October 2010, faculty.washington.edu/chudler/choco.html. Tomazincic, Sara. “Dessert Hungry.” Dessert Hungry, 06 October 2014, desserthungry.blogspot.com/2014/10/tempering-chocolate-caramel-and-almond.html.